Jackson Samuel is a leading executive search firm specialising in Board and senior level appointments. and deliver business transforming senior executives. Jackson Samuel was established in 2004 as an independent firm to address clients’ need for a high value executive search service differentiated from the competition by its combination of responsiveness, agility, intellectual rigour and quality of insights into both the market and prospective candidates. Working on a retained basis for multinational and UK domestic clients under public, private and private equity ownership – we search across a range of sectors and functions. Our clients are typically senior executives for whom the successful completion of a search is business critical and who want a focused and dedicated high level service to ensure success. As an independent firm we are not constrained by ‘off-limits’ agreements or artificial sector boundaries. We have particular expertise in successfully handling sensitive and challenging assignments where there is a very limited pool of potential candidates for a role and confidentiality is paramount, often working to an aggressive time scale. To ensure success we only take on a small number of assignments at any time to guarantee absolute focus on the search and to maintain a high level of personal client and candidate care. Our broad, first hand, experience of business, and the critical ability to judge culture fit to a high level, enables us to assess and attract talented senior executives for our clients. From Compliance to Commitment; What Talent Wants; and The Golden Few. 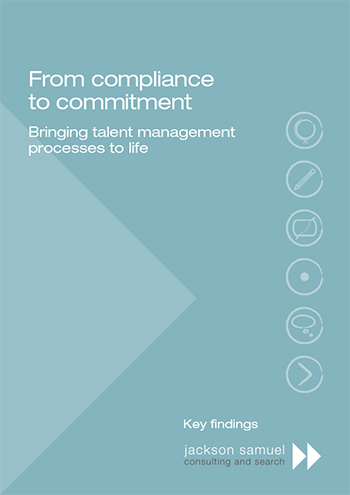 We researched talent management in 58 leading organisations to understand how to transform talent management from an exercise in compliance into one of true commitment. This seminal report contains over 90 pages of case studies, comment and analysis. Do you know what your talented people want from your organisation and understand which people represent the greatest competitive advantage to your business? This research explores how to focus attention on how to deliver what your talent wants. 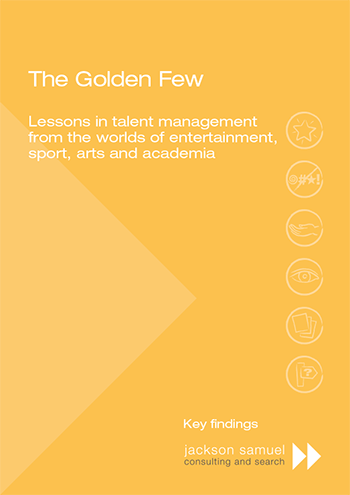 The Golden Few was published following research into eight unique enterprise organisations, including Manchester City Football Academy and Storm Model Agency. This report sheds new light on the subject of identifying and nurturing the truly gifted in their field.